With Opening Day right around the corner, we thought we would share some of our favorite tips on how to save big on your next trip to Tropicana Field. The Rays are often named among the most affordable teams in all of major league sports, so we wanted to show you some of the best ways to find the cheapest Rays tickets available. Direct from the Rays: Tickets as low as $9 - $10. ScoreBig: Up to 60% off face value. StubHub: Tickets as low as $9.50. TicketLiquidator : Tickets as low as $7. TicketNetwork : Tickets as low as $7. Craigslist: Be careful with Craigslist, but sometimes you can catch a good deal... especially on last minute tickets. You can even try to Win Tampa Bay Rays Tickets. For Monday - Saturday games, the first 100 cars with 4 or more people can park for free in team controlled lots. On Sunday games, all cars that contain 4 or more people can park for free in team controlled lots. There is parking available in downtown St. Petersburg at the Al Lang Lot, South Core Garage & Baywalk Garage. These lots are generally cost $5 - $10 and can be cheaper than parking near the stadium. You can then access the Looper Trolley for a ride to the stadium. The shuttle runs 90 minutes before the game and an hour after the game. This option is great if you want to experience downtown after the game. Food must be for individual/family consumption. Food must be individual servings, wrapped, bagged or contained within a soft-sided container no larger than 16" X 16" X 8". Water bottles must be sealed and no larger than a liter. Children's single serving juice boxes are also permitted. If planned properly, you can take a family of four to a Major League baseball game for only about $60. That assumes 4 tickets at $10 each, free parking & snacks brought from home. This is something that all Rays fans should be happy to cheer about! If you have your own tips on how to save money when going to Rays games, please share them in the comments below. I totally forgot that I took a bunch of pictures from the Rays clubhouse tour I took during Fan Fest. I enjoyed the tour because I think you get a real feel of the culture & mentality that Joe Maddon is trying to instill in his players. I didn't have the best camera with me, so feel free to share if you have any better pictures. Doin' It "The Rays Way" sign on the way to the dugout. The daily line-up card for media personnel. We all know this rarely is the same twice! Attitude is a Decision sign. Joe Maddon's office. Notice the wine? Gold Glove award, although I could not see who's it was. Helli or Longo? The post game disco ball. We can only imagine what these parties look like! "Fortune favors the bold" & "If you don't like it, pitch better!" signs. Fernando Rodney & Joel Peralta's lockers. The Rays coaches dressing room. Lets get the 2013 season started off right with a tailgate party before the first game of the season. Come hang out with the guys of Rays Rally to eat, drink & be merry before cheering on our Tampa Bay Rays to victory. Please see details below and make sure to RSVP here. Free hot dogs & snacks depending on how many people RSVP to the event. RSVP BY 5PM ON 4/1/13 TO MAKE SURE YOU ARE COUNTED. Giveaways: If we can get the RSVP total to 25 or more, we will have some items to give away. If you want to cook your own food and do not have a grill, we will have a few available to use. 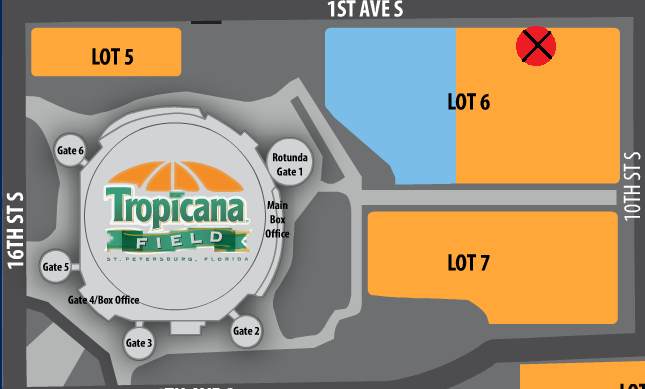 Where: We will be in Tropicana Field Parking Lot 6, near the exit at 11th St S & 1st Ave South. We look forward to meeting many of the dedicated fans of the Rays Republic! Remember to RSVP so we have enough food for everyone that decides to come.